"Your Connection with the Fish..."
Likely the first reels used for Carp fishing would have been the very earliest center-pin reels developed in the late 18th Century in Nottingham, England. These reels were based on the wooden lace bobbin and had very large diameter drums that allowed free running of the line. Center-pin reels were used successfully for many years, though their casting ability was somewhat limited by design. In 1880 a predecessor of the later 'fixed spool' came about by way of the invention of the "Malloch" reel. This took things to another level by allowing the drum of the center-pin to rotate a full 90 degrees, allowing the line to pay off freely during a cast, with minimal friction. The drum was then rotated back 90 degrees for the retrieve. Over the years, several center- pin reels became popular for Carp Fishing. Various models were developed and different materials were used to improve the functionality and performance of the reels. Some early Twentieth Century models that were favored were the Allcock ‘Flick ‘em’ style reel and later the Allcock ‘Aerial’. Though the center-pin reels were excellent for trotting, they were limited in their use in other areas. This prompted the development of the first ‘fixed spool’ reel (“spinning” USA) in 1905 by the textile worker Holden Illingworth of Bradford, England. This was to be the basis of all modern day spinning reels. The Hardy Reel company in England developed and patented the original ‘bail arm’ design and were one of the first to manufacture fixed spool reels in any number. Other companies began manufacturing fixed spool reels, which began to grow in popularity. One of the more popular models at the time that was used by the early carp anglers was the Ambidex reel made by J.W.Youngs of Redditch, England. A great reel that went to over 9 models and was responsible for helping to capture the carp record on 2 separate occasions! However, the great Hardy rivals, the Mitchell Company, developed the first fixed spool reel that was fully embraced by the early European Carp Anglers and set the standard for ‘Carp’ reels…. The Mitchell 300. The first models (pre-1954) were all designed with ‘half’ bail arms as the Hardy company still held the patent. The 300 model was later manufactured with the full bail arm and went on to be not only the most popular Carp Angling reel of its time, but probably one of the most popular spinning reels of all time. The Mitchell Company made many upgrades to the original 300 with the Mitchell 410 becoming very popular in the 70’s. At this time, however another reel manufacturer began to win favor with the Carp Angling fraternity. The Shimano Company changed the modern-day Carp reel forever with the invention of the ‘Baitrunner’. This 'Baitrunner" device allows an angler to fish with a closed bail arm and yet still allow a fish to freely take line. With a fully adjustable drag and ‘baitrunner’ system complete with its own, separate drag system; the Shimano range of reels are known as the one of the very best in the Industry, with the Aero GTE 8000 & 10,000 XT probably being the most popular carp reels throughout the world over the last 10 years or so. There are many companies that now offer good quality reels with a ‘free running’ facility geared specifically to Carp anglers and the entry level carp angler now has a range of high quality products to choose from. As specialist angling situations arise the reel manufacturers have designed and improved even on the original, to accommodate the needs of the angler. There are some instances that require the angler to fish at greater distances than traditionally thought necessary to catch carp. This requires a reel with a shallower spool but with a greater line capacity and retrieval ratio. In today's market, many well-known companies design and manufacture Big Pit reels. To show an example of these reels, here are Shimano and Daiwa's versions of these specialist “Big Pit” reels; although these examples have been out over 10 years now. they are still going strong and have proven themselves, true "work-horses" in their field! The Shimano ‘Longcast’ baitrunner and Daiwa ‘Grandewave’ reel have a much larger line capacity than a standard reel allows further distance on the cast and superior line retrieval. Both models still employ the free running facility to allow the fish to take line. Many kinds of reel have been used over the years for Carp Angling including ‘bait-casting’ style reels such as the ABU Garcia Abassadeur shown below. Preferred by the Traditional, American Carp anglers that have a proud family history of carp fishing that goes back many generations in the Pay laking communities, primarily located in the South Eastern States. It is important when making the decision on which reel to purchase to ensure that you are choosing the appropriate reel for the given job. 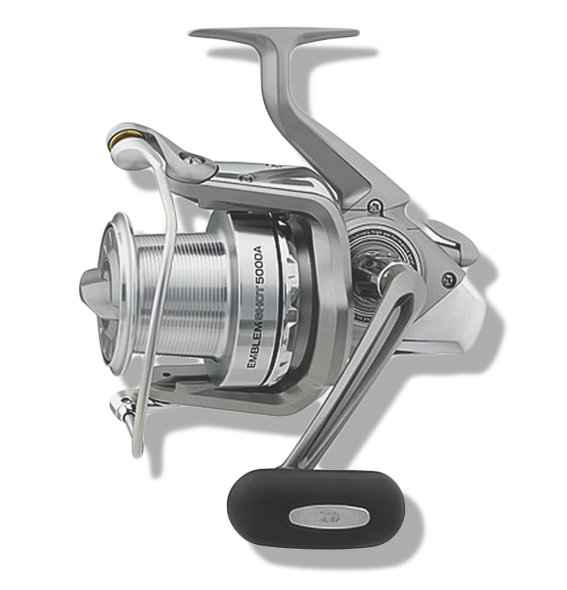 As an example, the Shimano 10,000 XT is probably one of the best all-around carp reels available that will serve the angler for all but the most specialist situations whereas the Daiwa Emblem or Shimano Longcast are specialist reels that are very large, have a specific purpose and would not be suitable for all angling situations.